The 12th Special Forces Group (Airborne) traces its lineage from the 6th Company, 2nd Battalion, First Regiment, 1st Special Service Force, a joint Canadian-American special operations unit from World War II. 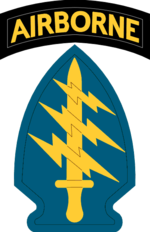 The 12th Special Forces Group stood up as a Regular Army special operations unit under the 1st Special Forces in 1960 and was subsequently moved into the Army Reserve in 1969 where it reminded until deactivation in 1995. Activated 9 July 1942 at Fort William Henry Harrison, Montana. Disbanded 6 January 1945 in France. Reconstituted 15 April 1960 in Regular Army; concurrently, consolidated with Company C, 2d Infantry Battalion and consolidated unit designated as Headquarters and Headquarters Company, 12th Special Forces Group, 1st Special Forces. Withdrawn 14 December 1969 from the Regular Army and allotted to the Army Reserve (organic elements concurrently constituted). Group activated 24 March 1961 with headquarters at Chicago, Illinois. Location of headquarters changed 19 January 1964 to Oak Park, Illinois; changed 1 September 1970 to Arlington Heights, Illinois. The Group was deactivated, along with the 11th Special Forces Group, on 15 September 1995. Many members of the 12th SFG transferred to 20th SFG following the group's inactivation. ^ "Doug Stanton: The Quiet Professionals: The Untold Story of U.S. Special Forces in Afghanistan". Huffingtonpost.com. 24 June 2009. Retrieved 14 March 2013.